Home Wyoming Living Wyoming Celebrates 2017 Make a Difference Day in a Big Way! 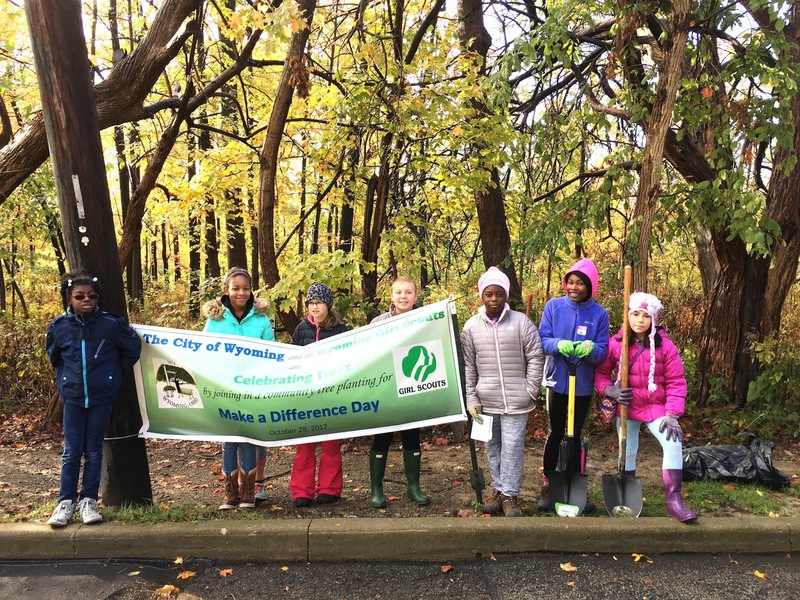 Wyoming Celebrates 2017 Make a Difference Day in a Big Way! Thank you to those Wyoming residents that came out even though the day started out cold and raining. 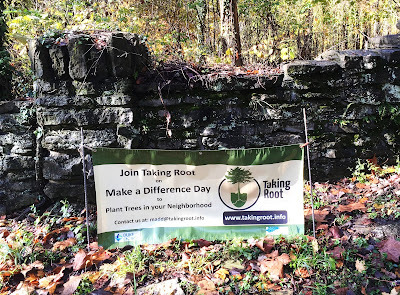 Besides a number of dedicated citizens, our “urban foresters” included JWC members, Boy Scout Troup 221, and four of the Wyoming City Council candidates. Thank you to the City of Wyoming for supplying the trees! On October 28, volunteers from across the country united for Make a Difference Day, one of the largest annual single-days of service nationwide. Since 1992, volunteers and communities have come together on Make a Difference Day (MaDD) with a single purpose: to improve the lives of others. 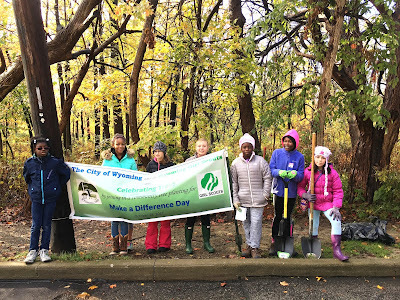 For the third consecutive year Wyoming residents celebrated MaDD, and this year that celebration grew to three different activities: a group of city volunteers planted a number of trees at the City’s Recreation Center, a larger group of volunteers planted nearly 100 trees at Wyoming’s Stearns Woods Preserve, and the local Girl Scout Troops planted honorary trees and held a MaDD ceremony also at the Stearns Woods Preserve. 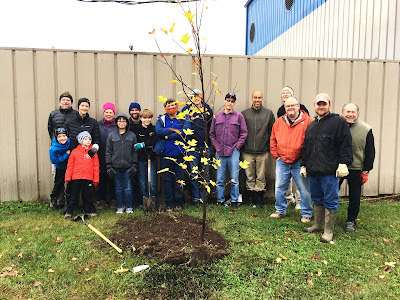 Thank you to all the volunteers from Wyoming and the Mill Creek Council, to the City of Wyoming, and to Country Fresh Market for the box of very tasty apples for making this year’s efforts to replenish Wyoming’s Urban Forest, the best yet … Way To Go Wyoming! 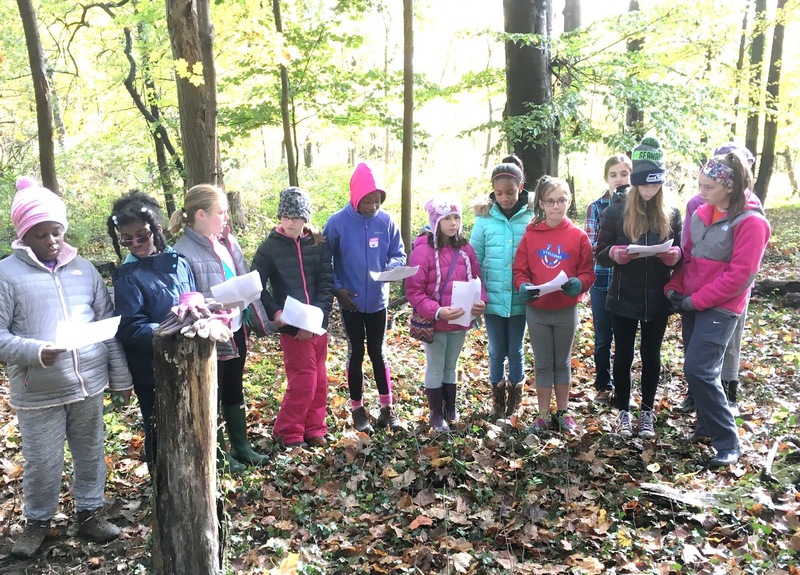 Among the trees planted in Stearns Woods were three trees donated by Junior Wyoming Girl Scout Troop 42844 and Cadette Wyoming Girl Scout Troop 43517. 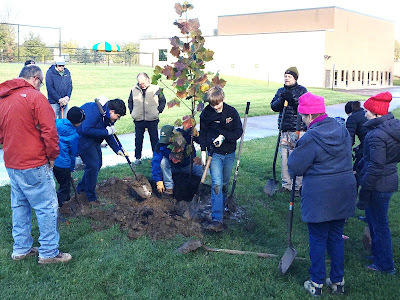 The trees were planted in a special area that hopefully will be set aside by the city to receive trees donated by Scouts or similar organizations. In addition to planting their donated trees - a Yellow Buckeye and two American Sycamores - the scouts held a brief dedication ceremony to acknowledge Make-a-Difference-Day and celebrate their efforts to “make the world a better place.” The Scouts shared nearly two dozen benefits of trees as outlined by the Mill Creek Watershed Council of Communities. Even though it was a cold and rainy, volunteers came at 9:00 a.m. with shovels, picks, pruners, and a passion to plant trees that will reforest one of Wyoming’s hidden gems! They completed the planting of 89 trees and shrubs of various species on the hillside above Cilly Creek. 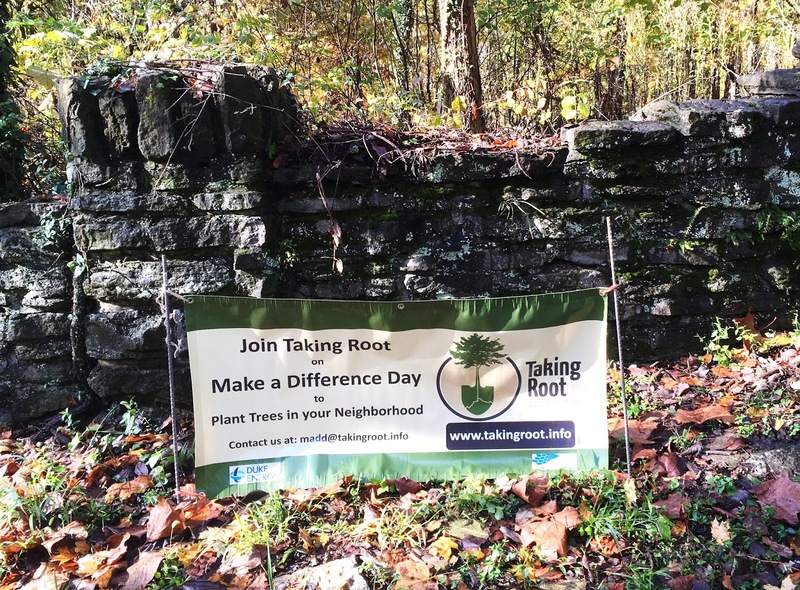 Their volunteer hours helps fulfill a local volunteer match in the amount of the grant that is reforesting and stabilizing Cilley Creek in Stearns Woods. 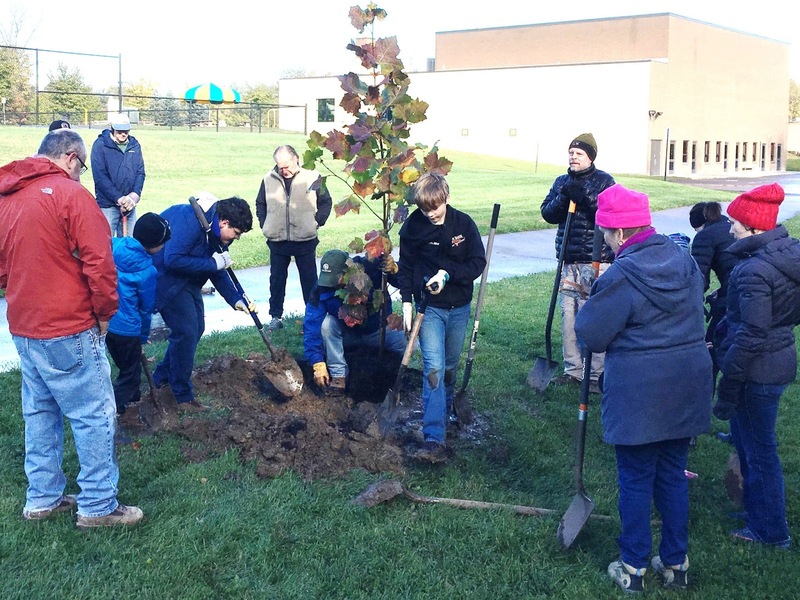 The next time you visit the Wyoming Recreation Center say hello to six new members of our Urban Forest located along the north end of the parking lot by the pool: “Baldy” Bald Cypress, “Si” Bald Cypress, “Zoe” Tulip Poplar, “George” Tulip Poplar, “Sam” Sycamore, and “Ace” Sycamore.